Wing span: 1 3/8 - 1 7/8 inches (3.5 - 4.8 cm). 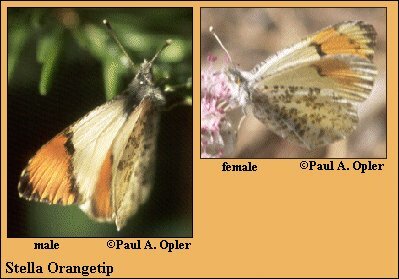 Identification: Upperside of male forewing with large, orange-red spot; border of apex dark, narrow. Female spot smaller; dark border with white wedges. Underside of hindwing with scattered, olive-green marbling. Some individuals are yellow. Life history: Males patrol, mostly in valleys, for females. Eggs are laid singly near tops of host plants. Young caterpillars feed on flower buds, older ones on flowers and fruits. Chrysalids hibernate. Flight: One flight from late March to mid-August, primarily mid-June through mid-July. Caterpillar hosts: Plants in the mustard (Brassicaceae) family including tansy-mustard (Descurainia), hedge mustard (Sisymbrium) and rock cresses (Arabis) species. Adult food: Flower nectar, including that of host mustards, violets, thistles, fiddleneck, and brodiaeas. Habitat: Deserts, open woods, orchards, fields, meadows, stream courses, canyons. Range: Alaska coast south to Baja California, east to North Dakota, New Mexico, extreme western Texas. Management needs: Preserve host plant and flyway habitats. Co., Boston, Mass. 540 pages, 44 color plates.